As a working mother with 4 children, there are many things that I find challenging. How do I get everyone where they need to be after school? How do I get that extra hour of work time in when I have a big project due? When do I get my haircut? How can I make everyone happy at the dinner table? As a parent trying to juggle work and family responsibilities, mealtime can be a time to reconnect and enjoy each other’s company, OR it can be a trying time as you attempt to please everyone. Add to the mix a child who is a very picky eater and you may be tempted to make several different meals to accommodate everyone’s requests. It may be fish for you and your partner, chicken nuggets for your 7 year old, and a vegetarian entree for your 13 year old. STOP! It does not have to be this way, nor should it. As a parent, you have a responsibility to make sure that your children eat healthy and balanced meals. As tempting as it may be to make different, easy dishes to please everyone, this is actually doing your children a disservice. You may be surprised to learn that your children actually like “adult” foods and, even if they don’t, they can learn to adjust when you give them the opportunity to do so. Think about a situation in the office when you were asked to take on a project or responsibility that felt outside your comfort zone. I would venture to guess that, in the end, you were able to get the work done and most likely felt proud that you were able to expand your work knowledge. On a different level, this is the same concept at mealtime. Your kids can learn to appreciate new “skills” (a taste for different foods) and may feel good about having taken this risk. Here are some tips that I have found helped my kids develop a wider appreciation for a variety of mealtime options. Plan your weekly menu in advance and solicit input from everyone in the family. If you and your partner want stuffed sole and the kids make gagging sounds, ask for their input on side dishes that they will eat. Encourage your children to help cook and prepare meals. Your child may be more interested in trying something if she helped prepare it. Make a few dishes each week that your children have chosen. If you want to stay away from chicken nuggets, offer a healthy salad as well that you can make into your meal. Make one dish for everyone in the family and establish this as the new rule. Explain that this will mean less work for you and more time to spend doing something fun together after dinner. Don’t get overly concerned if your child won’t eat everything on her plate. You definitely don’t want to get into a power struggle over food. Save what she does not eat and offer it later if she is still hungry. 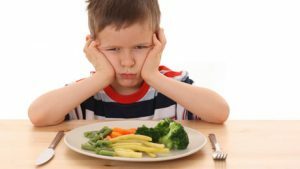 It is OK to deprive your child of dessert if he does not eat enough of his meal. This should be a reward, not a given. Don’t give in. In the long run, each and every one of you will be happier and will be well fed! Laura Jacobson, LICSW, CEAP is a Senior EAP Consultant at Comprehensive EAP. She has extensive experience providing parent-guidance work, and has supported individuals as they navigate the many responsibilities that working parents face. Laura is licensed as an independent clinical social worker and is certified as an employee assistance professional.